This is definitely not Mesolithic, but compelling nonetheless for anyone in North East England. 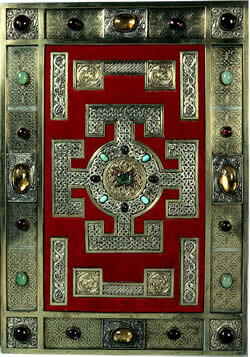 The famous Lindisfarne Gospels are coming to the ancient city of Durham this summer. There are fantastic opportunities for community participation and volunteering for folks in North East England—to promote education and enjoyment of one of the World’s greatest books dating to the 7th century AD. Volunteers are being sought to work with their local museum on Lindisfarne Gospels related activities to help celebrate the exhibition in Durham this summer. From 1 July to 30 September this precious manuscript will go on show in a must-see exhibition in Durham University’s Palace Green Library. Please read this news release to find out how to get involved. This entry was posted in British archaeology, Events and activities and tagged Durham, Lindisfarne Gospels, North-East England by Spencer Carter. Bookmark the permalink.